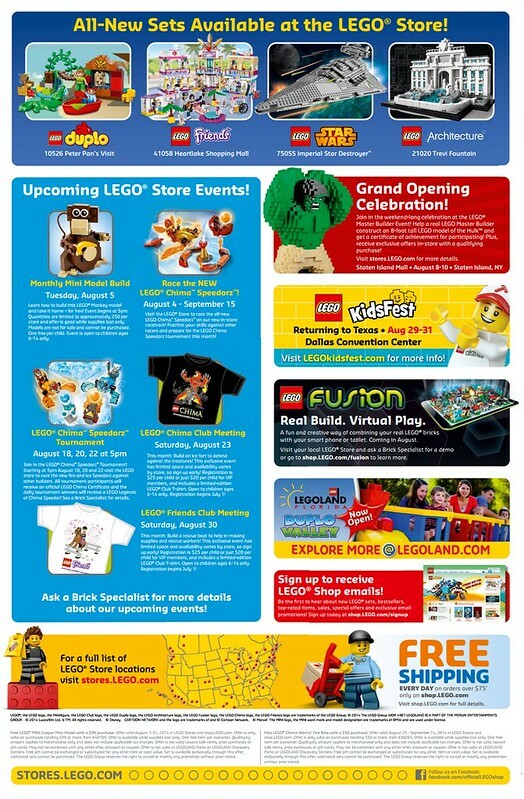 The August 2014 LEGO Store Calendar is now available and we can now discuss some of the promotions and events that are offered in stores and on [email protected] . For the freebies for August, the LEGO Creator MINI Cooper MK VII Polybag (40109) will be available with purchases of $99 or more and the offer lasts for the whole month or while supplies last. From August 25th – September 14th, you can get a free LEGO Legends of Chima Worriz’ Fire Bike Polybag (30265) with purchases of $50 or more. This offer overlaps with the MINI Cooper (40109) polybag promotion so if the Cooper polybags are still available by then, you can possibly get both polybags with a single purchase. In other related Chima news, the Summer 2014 wave sets will be available starting in the beginning of the month. 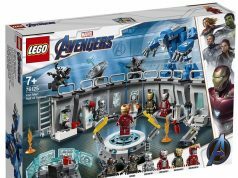 There are reports that the Ultrabuilds sets will not be available in North America so that is a disappointment. From August 4th – September 15th, visit your store to race the new Speedorz sets on a new racetrack. Get your practicing in before the Speedorz tournament later on in the month (below). 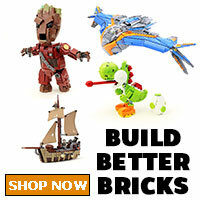 On August 9th, new episodes of LEGO Legends of Chima will be on Cartoon Network at 7:30a/6:30c. 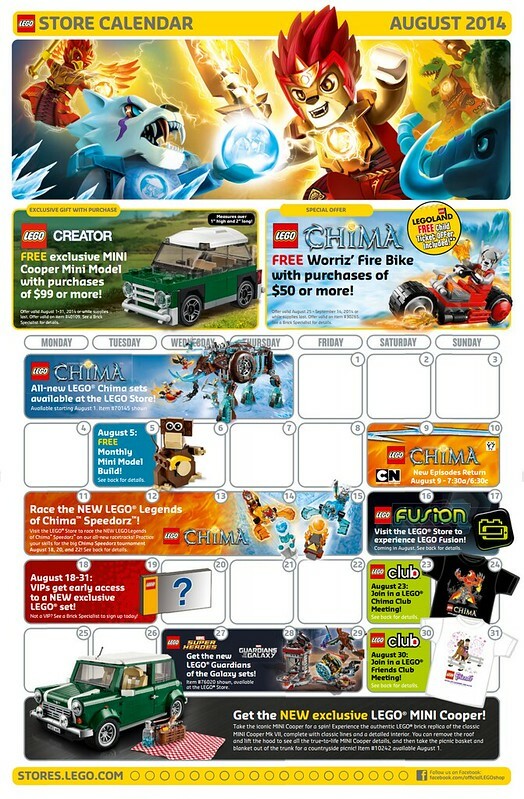 On August 18th, 20th, and 22nd at 5pm, the LEGO Stores will be holding a LEGO Chima Speedorz Tournament and all participants will receive an official LEGO Chima Certificate and tournament winners will get a LEGO Legends of Chima Speedor. There’s not mentioning of which Speedor you will be getting. The final piece of Chima news on the Calendar for Chima is the LEGO Club Meeting held on Saturday, August 23rd. The t-shirt you will be getting features Worriz powering up. 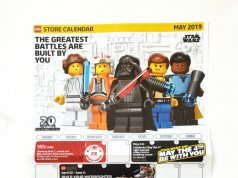 For non-Chima news, there will be a number of new set releases including the Summer wave of LEGO Star Wars and the LEGO Architecture Trevi Fountain (21020). The LEGO Creator MINI Cooper MK VII (10242) will also be available for everyone in stores and on [email protected] Finally, the newly announced LEGO Fusion sets, minus the Resort Designer, will be available as well. 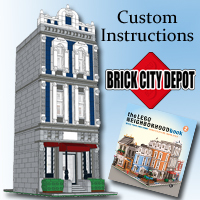 On August 5th, the Monthly Mini Build event will be a Monkey (40101). 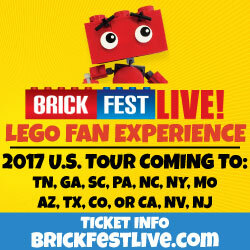 As with these events, get there early to ensure that the kids will be able to build one. On August 18th – August 31st, there is another VIP early access to an exclusive set. 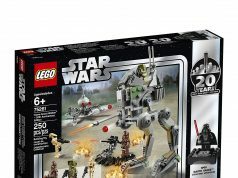 If we follow the pattern of last year at the same time when LEGO released the LEGO Star Wars Ewok Village (10236), I’m going to venture a guess that this set will be the rumored UCS Slave I (75060). I could be wrong but that’s my educated guess. 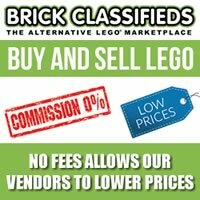 On Saturday, August 30th, there will be a second LEGO Club Meeting and this event will be a LEGO Friends meeting. I know this is a lot to soak in but there are some pretty exciting things happening for August 2014. What will you be getting during the month?